Chermoula is a great use of many of the organic vegetables and herbs that come in our weekly harvest box. 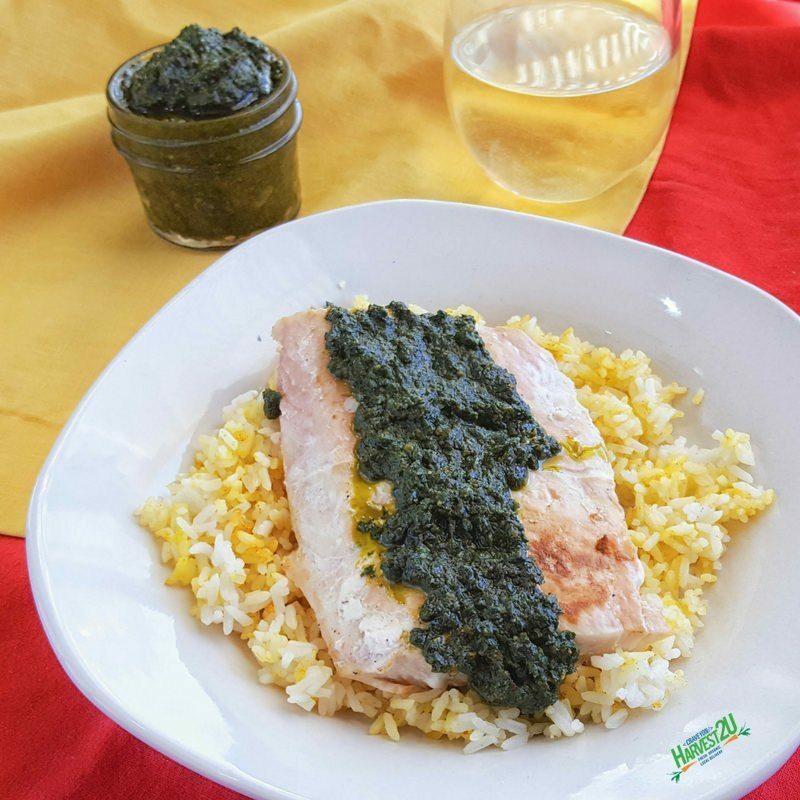 Chermoula is a Moroccan (North African) green sauce with fresh herbs, spices, and preserved lemons. Think of it as a cousin of Pesto and Chimichurri. It is excellent as a finishing sauce on fish, or use it as a marinade for other meats. I also mixed a few tablespoons with some yogurt for a salad dressing. One ingredient that might be new to you is the preserved lemon. Preserved lemons are an everyday staple of North African and Moroccan cuisine and are nothing more than lemons that have been cured in salt for a few days/weeks. You can try to find them in the Middle Eastern section of the store or make your own with these easy instructions from NPR. You can swap out the zest of one lemon instead along with a pinch of salt if you don’t want to make or buy them. The taste isn’t exact but a decent replica. Place all ingredients, except olive oil, salt, and pepper, in a blender or food processor. Pulse a few times to chop up the ingredients, then process until the ingredients begin to form a paste. While the blender or processor is running drizzle in the olive oil.